If we really knew each other, if we could see and hear what was going on under the surface, would we still be friends? 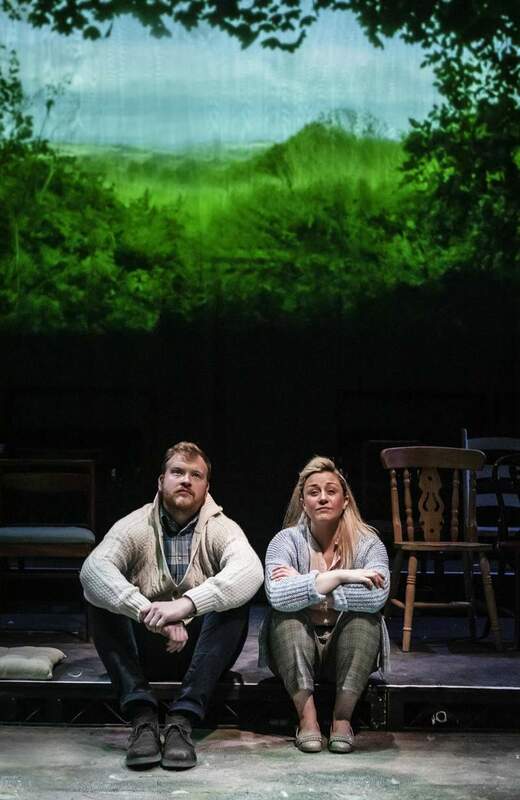 Under Milk Wood presents a lifetime of promise, passion and pain, wrapped up in one single day. One day, any day. One community, any community. With seats on all four sides, we become part of this community as we take our place and wait. A part of this community where routine is comforting to some, yet suffocating to others, and everyone erroneously believes they know everyone else’s business. It’s what lies beneath the surface that fascinates writer Dylan Thomas: the clamouring schemes and dreams, both joyous and terrifying. Only we can see what goes on behind closed doors in the darkened houses of Llareggub. Only we can hear the innermost thoughts and desires of the residents of this small Welsh coastal town. Welsh? Well, not in Elayce Ismail’s daring adaptation of Thomas’s classic 1954 radio play, now relocated to a North East seaside town, where each day is like every other day and where time stands still, like the clock in the Sailors Arms. It is Spring in Milk Wood. Whatever the weather outside, Thomas is adept at persuasion. Are you ready to immerse yourself in the dynamics, motifs and rhythms of this symphony of life, where each living being has a voice and all these streams of consciousness come together in this juxtaposition of life and death, love and hate, comfort and despair? In a cast of over 60 colourful characters, two narrators command the stage. Moving and speaking fluidly and freely, exchanging meaningful glances with natural ease, Christina Berriman Dawson and David Kirkbride take on every role with a range of accents and mannerisms, supported by Kris Deedigan’s evocative film projected large on opposite walls and a haunting soundtrack of music and voices that weaves its narrative into the action on stage. With morbid fascination, we witness Polly Garter, Captain Cat, postman Willy Nilly and the others going about their predicable daily lives – extraordinarily ordinary souls like demure Mr Pugh with his raging, murderous passion towards his totally unsuspecting icy wife. Revelling in the joy of the spoken word, Berriman Dawson and Kirkbride present the mundane in all its glory, playing with sound from the sparse, symbolic props and playful experimentation with a loop pedal! Combining fresh technology with Dylan Thomas’s undeniable pure performance poetry perfection, the result is an intense 90-minute experience bursting with sensory stimulation.